For other wrestlers who have used the name Cuervo, see this page. Titles: Mexican National Atomicos Championship (3, w/Ozz & Escoria, 2 w/Chessman, 1 w/Espiritu), AAA World Tag Team Championship (3) 1 (w/Ozz) & 2 w/Escoria, Mexico State Welterweight Championship, AJPW Unified World Tag Team Championship (w/Ozz), AAA World Trios Championship w/ Zorro & Escoria. Began his career as a local wrestler in Arena Naucalpan where he was actually one of the most over tecnicos for a brief period. Antonio Pena took notice of this and recruited him into AAA where he immediatly got a huge push as a tecnico heartthrob in late 1997. Since nobody can even remember that - obviously the idea was a huge failure. He returned to the independent scene and remainly largely unknown until the Black Family formed in 2000. 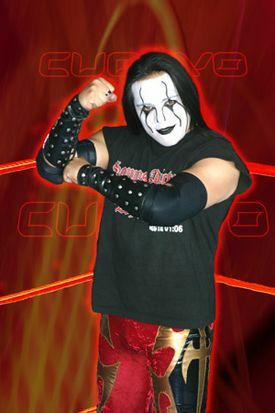 He was one of the original members along with Chessman, Charly Manson and Escoria. Cuervo was perfect for the group as he was an excellent base for the high-flying tecnicos and a great rudo. The group were known for their excellent matches with Los Barrio Boys and always being associated with the top rudo in AAA. Teamed up with Ozz to become the first ever holders of the AAA World Tag Team Championship in 2007. Since then he and his partners have basically been treated as midcard acts in AAA except for the occasional main events when they are used to take bumps and do the job in place of a top guy such as Cibernetico or El Mesias. Currently would be ranked second on the depth chart of his group behind Ozz but ahead of Escoria. In October 23 2011 in Tokyo, Japan, achieved a historic victory with Ozz, when defeated The Great Muta & KENSO to win AJPW Tag Team Titles, becoming the first mexican wrestlers to do. ??/??/?? hair El Cuervo El Goleador ? Historical! AJPW Tag Team Champions-Copyright 2011 Y's Sports Inc. This page was last edited on 12 October 2018, at 09:42.